Happy Thanksgiving! Last night's show was very unusual. TINA was fierce as usual, but here are a few observations that distinguished last night from the others. I think everyone expected some kind of acknowledgement that it was TINA's birthday, but the band did not sing Happy Birthday or anything. The only comment was after intermission when TINA said she had a birthday present of Beyonce and Jayzee (?) coming back stage. 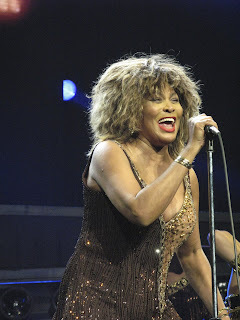 The audience tried to sing Happy Birthday and it was loud enough TINA could hear it (after Nutbush). What seemed like her taking extra bows in response to the birthday song, turned into the final bows. She did not sing Tender With Me Baby. Three stage guys came out on stage and spoke something to TINA, then she waved good bye and walked off stage. The audiences wasn't sure what happened. Several people in the audience said there is a local law relating to union labor, and that shows are not allowed to continue past 11:00 pm....there were about 8 minutes left until then. Several people thought they had cut TINA's microphone off, but I find that very hard to believe! After the show, around 12:15 am, I was going up to my hotel room. I was already in the elevator but the elevator didn't work and the doors keep opening on the lobby level. When the doors opened, Malcolm (the stage manager) was standing there with two other crew members. I saw him and asked "Are you Malcolm?" He kind of laughed and said something like "Yes, who wants to know?". He got into the elevator with us and we chatted for a quick minute. I asked him what happened at the end of the show. He said they weren't really sure themselves, but it was some kind of power outage. Who knows what really happened? The "eye" for Golden Eye never closed all the way, so when TINA appeared behind the eye, you could see her the whole time. And last, the audience last night was probably the worst audience of all of the 40 shows I have seen of TINA. I was very saddened that her birthday audience would be so quiet for most of the show. I was in the 6th row, and virtually everyone in the first five rows sat down for most of the show. At one point, when the audience finally got loud and stood up, TINA actually said something like, "Are you awake out there?" So, that's the wrap for now. I'm thankful to see TINA again tonight! The Top 20 Concert Tours ranks artists by average box office gross per city and includes the average ticket price for shows in North America. The previous week's ranking is in parentheses. The list is based on data provided to the trade publication Pollstar by concert promoters and venue managers. All figures in U.S. dollars. 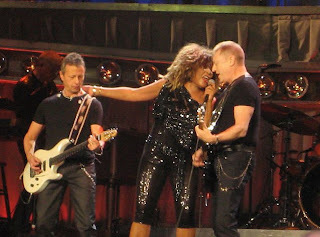 3: (New) Tina Turner; $1,813,997; $103.27. 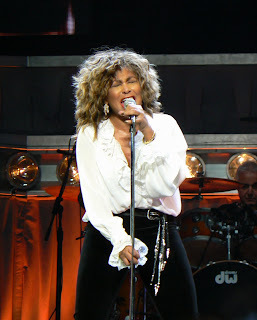 I was at the Monday night show at the Bell Centre which was sold out and the whole evening everyone was on their feet dancing and singing with Tina. When she sang Simply the Best everyone went wild standing and singing and after she finished the song she had a great responds and had even tears in her eyes and kept on bowing and said after that she remembered working Montreal many times over the years, but never recalled a response like that. It was not only Wednesday night. I'm so happy I was able to witness the last week of the tour. Montreal was absolutely FREEZING but the shows were wonderful as always. The Monday night crowd was ok, but Wednesday rocked out. TINA said that she remembered working Montreal many times over the years, but never recalled a response like that (Wednesday night). 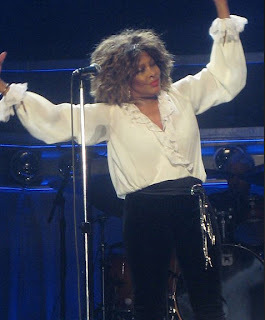 Friday in Toronto, when she and Stacy Campbell started their "dance off" during Be Good, TINA actually danced out of her shoe! It was so cute. The shoe came off, and she looked down, and was like, hmmm....so, she just kept dancing! The stage hand grabbed the shoe and held it out for TINA to step into. She was trying to tell him to leave it alone, but he didn't look up. Stacy kept holding onto TINA, and after a few seconds, TINA stepped back into the shoe. I'm sure that most of the audience didn't even know what was happening. Both Toronto shows were wonderful with great audiences. The last night, I was crying like a school girl as that was probably my last time seeing The Goddess. It has been a wonderful journey, and here's hoping to a second US leg of the tour!! Toronto tonight was AMAZING! Tina was at her best tonight. With it being closing night in North America, she was having a good time along with everyone else in the audience and the band. One of the best shows that I have seen so far on the tour. I had front row center seats tonight, and Tina was pointing and smiling at me all night long. But the best part of it all was when she was doing her last goodbyes, she walked right over to me and said "
Goodbye Donovan!" I was almost in tears!!! Also, at the very end when she says her goodbye, she usually walks to the backstage area and before she is actually out of sight, she turns and does a last wave as she is walking. This time, she turned around and looked at the audience for about a good 5 to 10 seconds, and she was about to start crying. It was a moment I will never forget. All I can do is hope that after Europe she will come back to the US. I really hope so!! Lee glad to hear this was your 42 show and 5 more to go! Enjoy tonight and anyone else there! I loved the entire show and tonite was probably even better than Monday but of course we were closer, LOL. 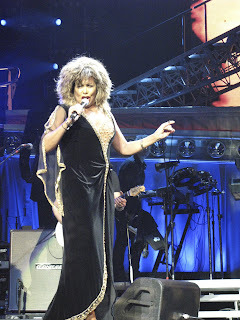 Loved Nutbush how she hovered right above us in the 9th row. Fun to be that close and dead center. Hugs and kisses Elle for those seats back in 2000 at the same venue, and I know my brother Al came over to give his thanks also. And for all you do for the fanclub. Enjoy the rest of the tour! I know you have a lot ahead of you. Safe trip back to Europe also.Tina rocked the Coliseum like she wasn't sick at all. She was totally outrageous. My brother and his partner loved the show and had a blast and without a doubt my friend from New Orleans had a great time. Long overdue. Linda joined us for the show b/c my partner was ill and took some amazing photos. My brother tried to take some video with his phone but honestly the sound wasn't great and we've seen some great stuff out there so I will spare you with those. One incredible night on Long Island. Mention to Pete. Those clips you have, why don't you just toss them up on youtube and try to merge a bunch together. Later once the tour is done and a lot more videos are up there I plan on making a compilation collection of the best stuff! More also in the works of some material past and present fans haven't seen so stay tuned! Enjoy the tour everyone! Loved seeing the 2 shows I saw and sad that's it for me but will continue to live it through all of you! The winner for November is Paulo Fonseca. Congratulations Paulo.! Please e-mail your address so we can mail your TINA! CD.